We are a group of Doctors spread at different places of Delhi providing a comprehensive integrated medicine of homeopathy, ayurveda, naturopathy, idiopathic, as well as life style management with integration of tongue & pulse reading. 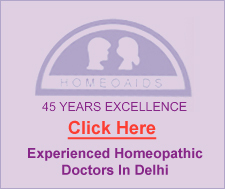 Senior homeopath working in posh colony of south Delhi, Green park since last 45 years with a high repute in curing those surgical & post-surgical which were left out by most senior doctors. A humble doctor with his international repute. He has received "Appreciation award 2007" & "Yugvir Singh award 2008" given by the state government of India. It was Dr. Samuel Christian Friedrich Hahnemann, an allopathic physician of that time who is founder of this great science. Although vitalistic concept of the science existed since hippo crape but it was overlook. Hahnemann realized this concept 7 applied not only on human body but even to the seemingly inured substances from all kingdoms of matter be it plant, animal or mineral. When his allopathic practice of no principles of that time bugged this doctor up where it comprises of leaching, purgation, etc., he converted his profession in translating various books. It was while translating books in 1796 that he came across a view that Chingchona (China) bark cures the typhoid fever because of his bitter taste. He disagreed with it and decided to prove it. He took china into his notice. He struck the basic principle of nature that "similia similibus curentur" that is the like cures like. He has proved china producing all symptoms of typhoid fever on him so he came to the conclusion that only those substances, which are capable of producing the similar kind of symptom, like the disease can cure the disease. This is a very basic principle of homeopathy on which it stands like the immovable stone. This principle of homeopathy has been stated in book called "Organon of medicine" which has come in six additions from time to time. The medicinal part has been stated in the book called "Materia medica", where the two medicinal actions on healthy human being have been compiled. This rough picture must match the disease picture and his whole similarity to cure the disease. Disclaimer: Dear patients please be informed that we do not manufacture/market any medicine in our name. We only use branded medicines from reputed companies. Anyone using our name and logo is supplying fake medicines for which we are not responsible.